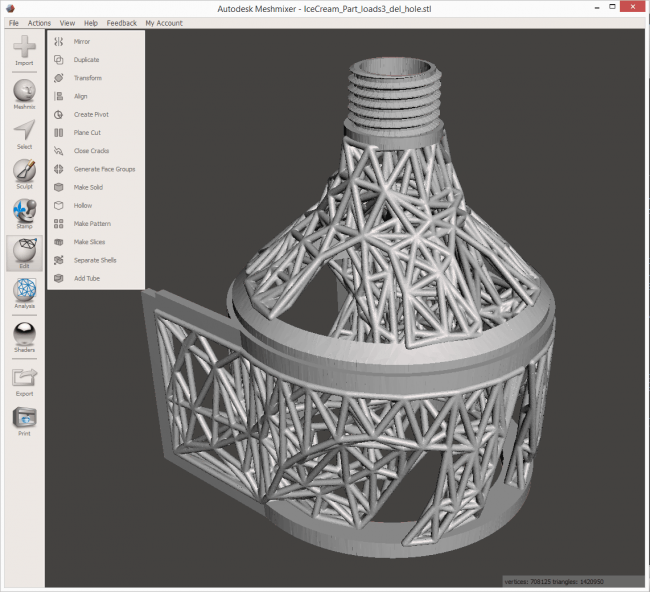 How to optimize a mechanical design for 3D Printing? This topic is crucial when you’re re-designing an existing part, whose shape is derived from manufacturing needs. In this case study, we explain how to use cool softwares to re-design a part with the same function, same performance but less material. 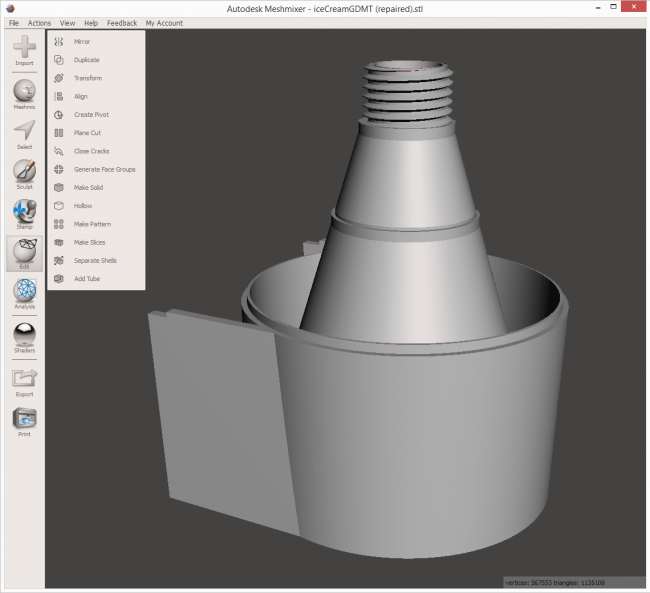 2 weeks ago, Jess mentioned in an article about 3D Printing and mechanical engineering how we redesigned a spare part for an old ice-cream machine. This week, we would like to focus on the process of redesigning a part and the softwares you can use. At Sculpteo we deal with ‘reverse engineering’ on a daily basis, this is one of the most common and appropriate applications for 3D printing: spare parts manufacturing. In this case, the original component that this client provided us, in fact, belongs to a 30 year old ice-cream machine whose production has been stopped by the manufacturer, so it needed to be replaced due to wear and tear, our customer couldn’t rely on an original part any more and turned therefor to us. 3D Printing saved this client a lot of money compared to the option of acquiring a whole new machine. After this first step we proposed to the client to redesign the part, optimizing it for additive manufacturing, which not only reduced its price, but also make it more efficient. 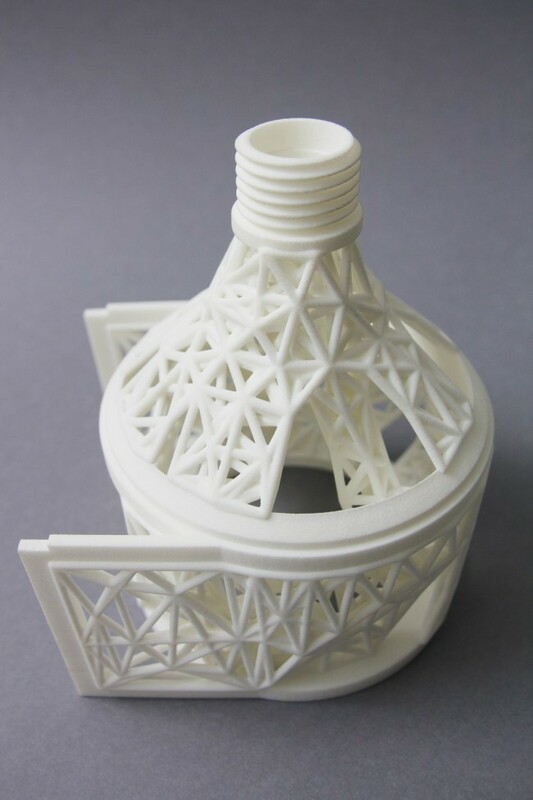 This room for improvement is due to the fact that the original part’s shape derives, apart from its function, from the manufacturing need of being extracted from a mold; this can be ignored since we are now using 3D Printing to produce it. 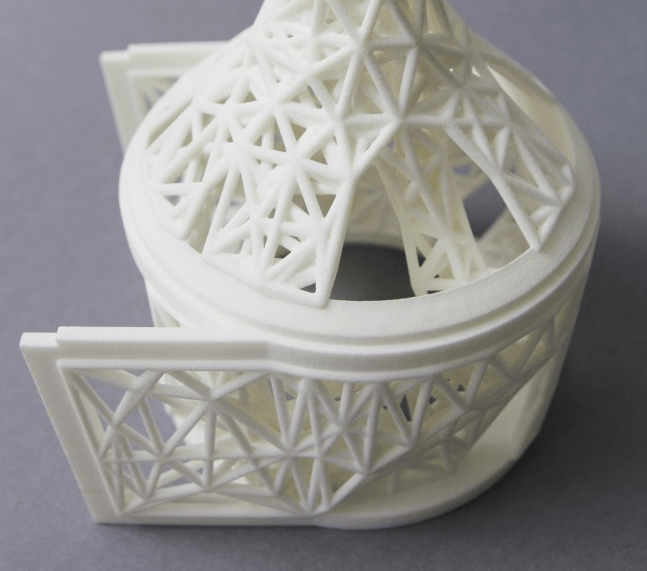 Thanks to the “layer by layer” manufacturing process in fact, 3d Printing is able to give life to high complex shapes, with cavities and undercuts, otherwise impossible to produce with any other technology. Our first goal was to define a new shape that would have allowed the piece to perform the same function, with same performances and durability, while considerably reducing the amount of material needed. We got in touch with the client in order to understand how the part works inside the machine and interacts with other components; doing so we were able to apply loads, constraints and objectives to the digital model, relating them to the new material utilized: polyamide. This process, called “stress analysis”, has a visual output that allows to understand how forces work across the part while performing the specific function. Thanks to this analysis we were able to design a new, more efficient, shape that was avoiding unnecessary material. We use solidThinking software for this first step. solidThinking Inspire is an efficient concept generation tool. Traditional structural simulations allow engineers to check if a design will support the required loads while solidThinking Inspire assists you by creating new geometry within your package space using the loads as an input (They offer a free trial). 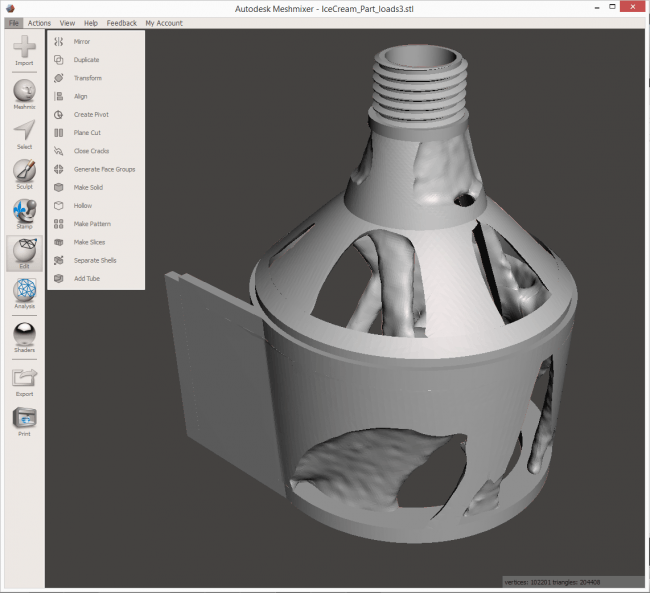 This screenshot shows the part optimized after stress analysis. Lastly we decided that we could reduce the weight of the part even more by applying a “lightweight” algorithm to the resulted model, transforming it in an even more intricate but still very resistant structure. Professional solution to create this kind of structure are available (for instance 3-matic by Materialise) but the good news is that the free MeshMixer by Autodesk allows you also to apply this kind of volumetric patterns. We used the ‘make pattern’ tool to modify the 3D model. Eventually we obtained a new optimized part, thanks to 3D printing. If you’re redesigning a part, and thinking of lightweight structure, don’t hesitate to contact us and share, we would be happy to help!